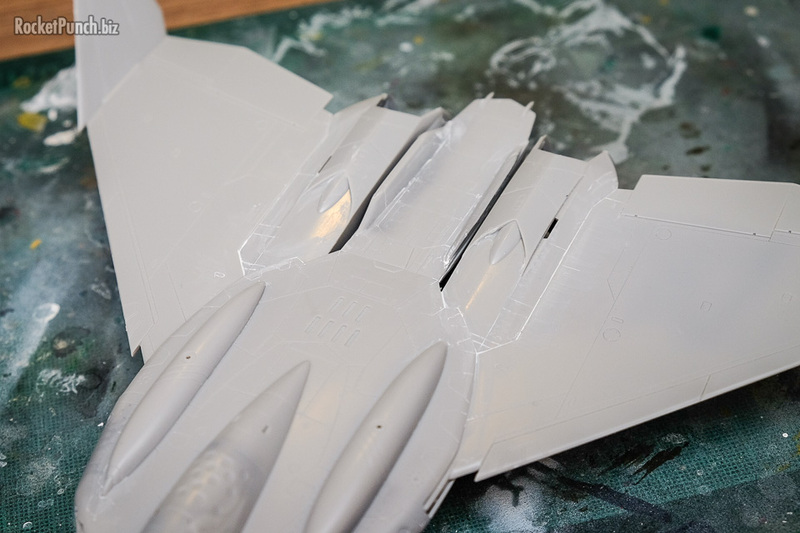 There’s a very obvious step on the wing joints which I try my best to fix. Nothing too drastic like sanding like mad though. Just an attempt to make the step look less jarring. 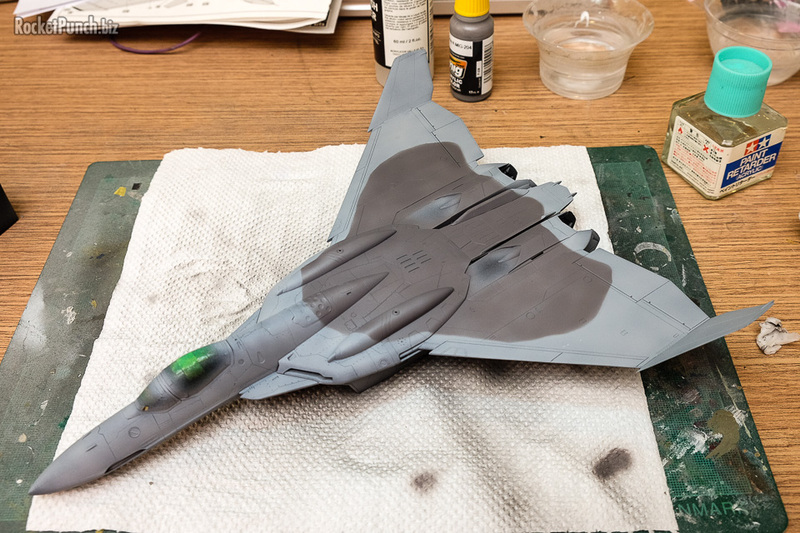 Painting begins with a base of black primer. I’m going with the camo from the kit instruction since I couldn’t come up with something better. So first up the light gray. Using blutack as a mask, the darker gray goes on. It went quite smoothly this time. 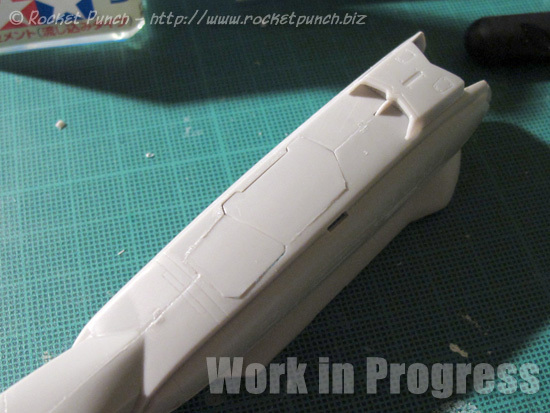 The engine sections on the dorsal were masked off and painted. 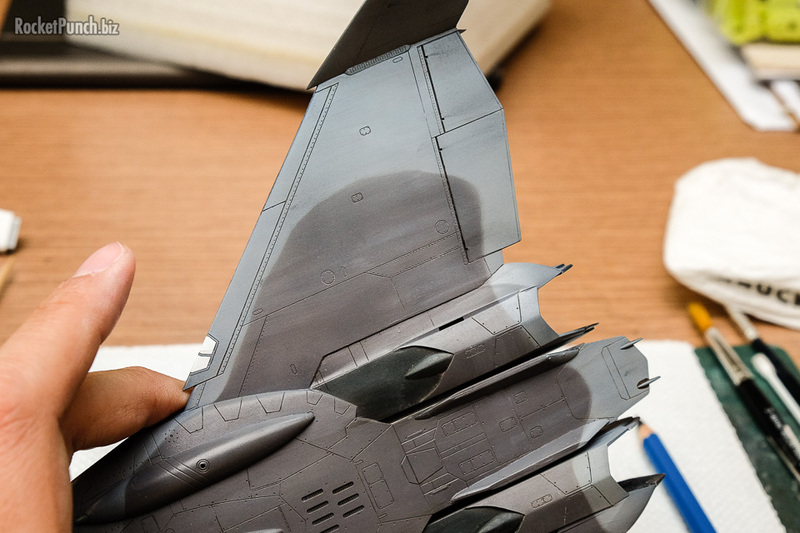 Then a gloss coat is sprayed to prepare for decals. I decided to skip all the stencils. 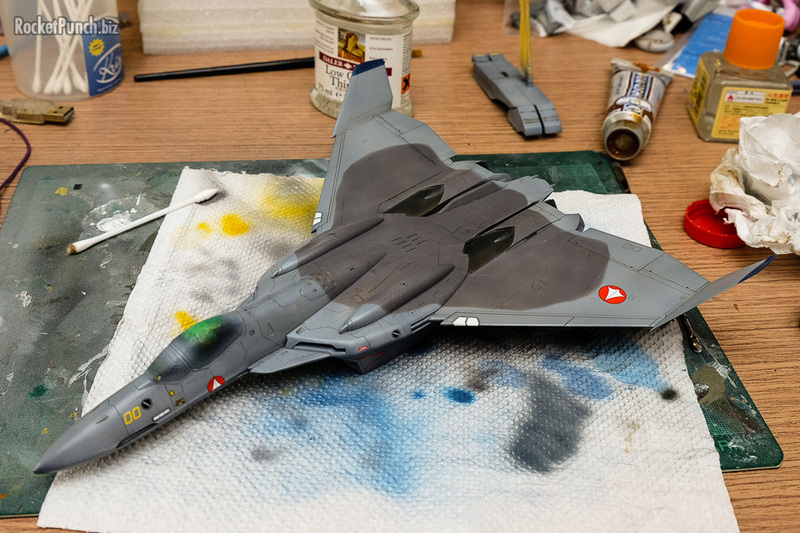 As usual, Hasegawa’s decals are thick and require a lot of Mark Softer. But once cured, they look fine. 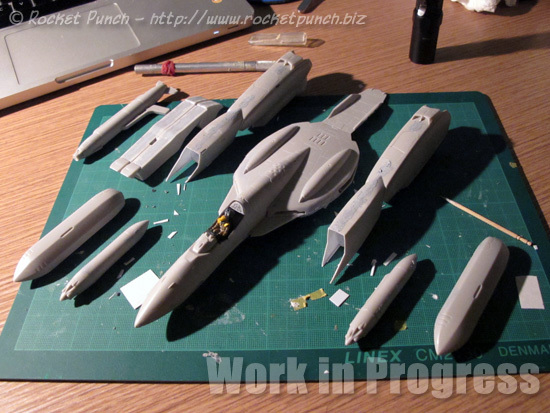 Some prepainting was required for the wingtips and the tailfins. 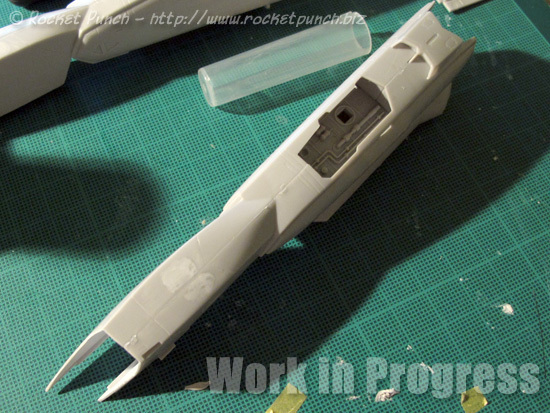 This simply means more tape and being careful about overspray. 24 hours of curing later, I wiped down the kit with a wet cloth to remove any decal residue. 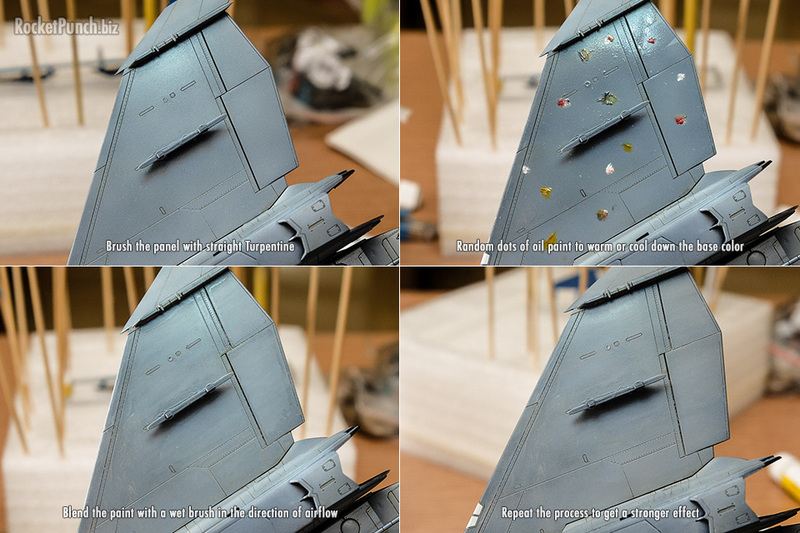 After that it’s another glosscoat to seal the decals in. Panel line wash is next with Raw Umber oil paint and left to dry for 24 hours. During this time I notice parts of a formation light decal tore off. I carefully re-attached these back with Future. The result is OK if not looked at too closely. I decided to try out some pin washes with oil paint following the instructions from my friend Maxwinamp. The effect is two-fold: 1) it weathers the surface to simulate airflow over the mecha 2) I find it somewhat blends the camouflage by giving an overall filter. 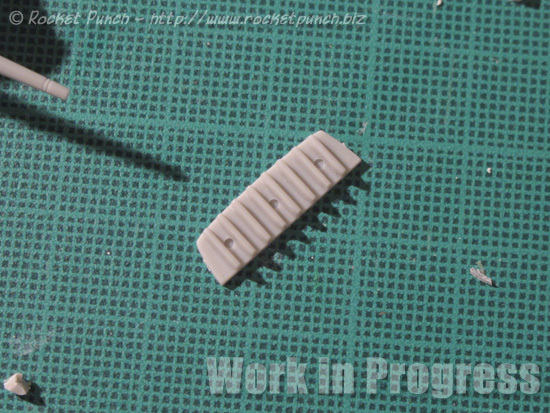 I went easy on the pin washes though as in canon, the VF-0C wasn’t used heavily operationally. After a day of drying, I took another look at the kit and decided it needed more weathering. I went with white and black oil paint only for this round. I also added streaks with a 6B pencil and swiping the marks with my thumb. 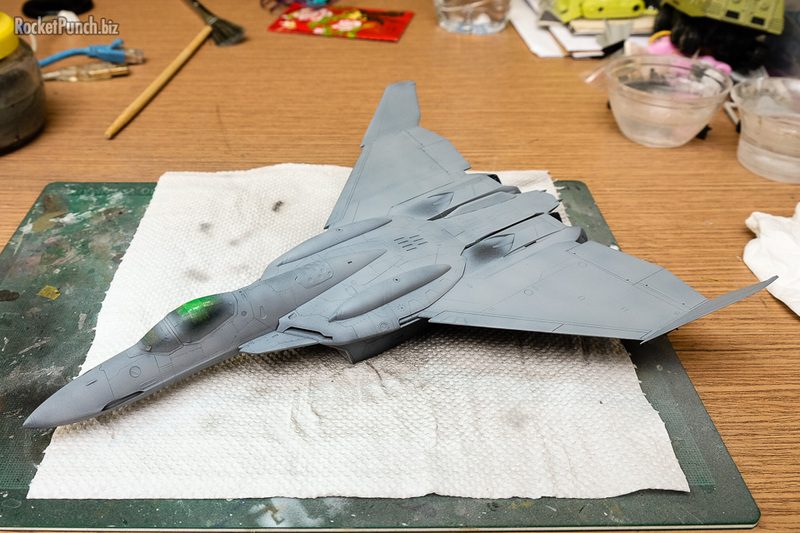 Final assembly is next along with painting of the small details like wingtip lights. 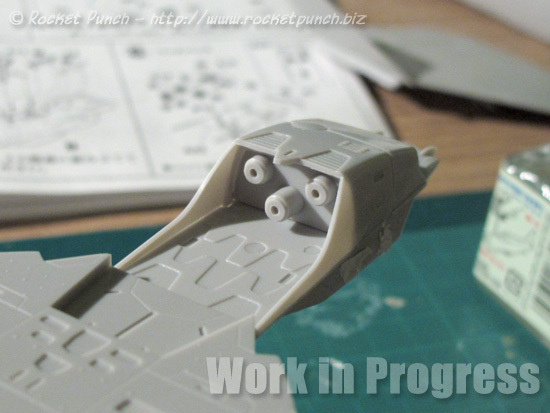 Next up on the workbench is another shelf queen from January 2011. Yep, 6 years. Unfortunately I’ve had to wipe my website late last year and I lost a lot of in-progress pictures of this build (Update: I have since recovered said content). Anyway, work continues with drilling a hole for the pole. I’ve had to put the hole off-center as the gunpod was in the way. Nothing too drastic though. 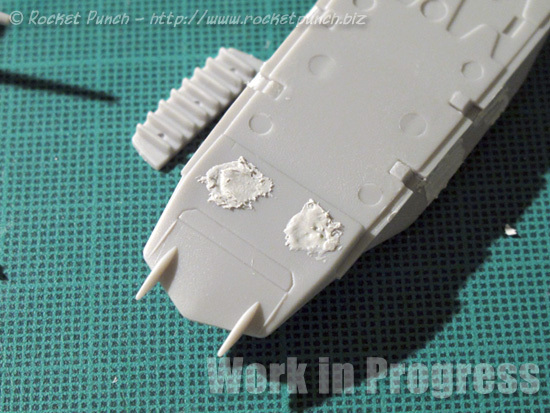 The brass rod was then reinforced with epoxy putty in spots that can’t be seen from the outside. 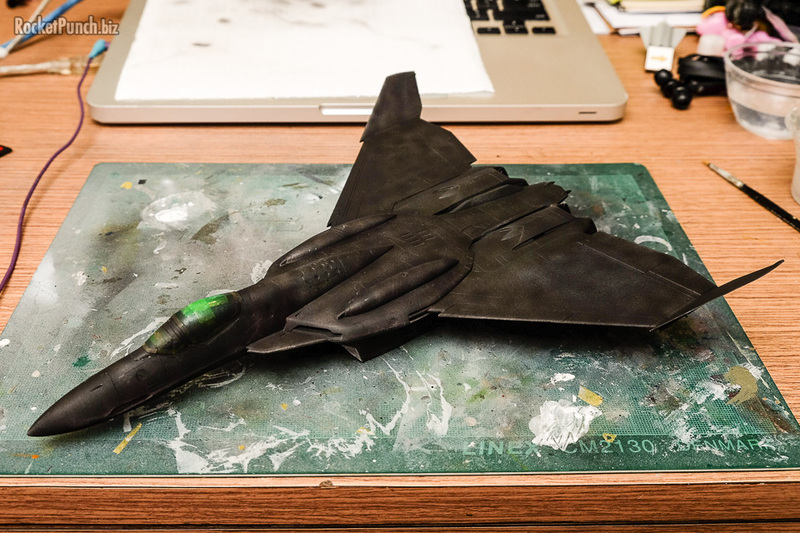 Hasegawa typically designs its Macross kits to build in subassemblies. Usually it also means you can paint them up before putting everything together. 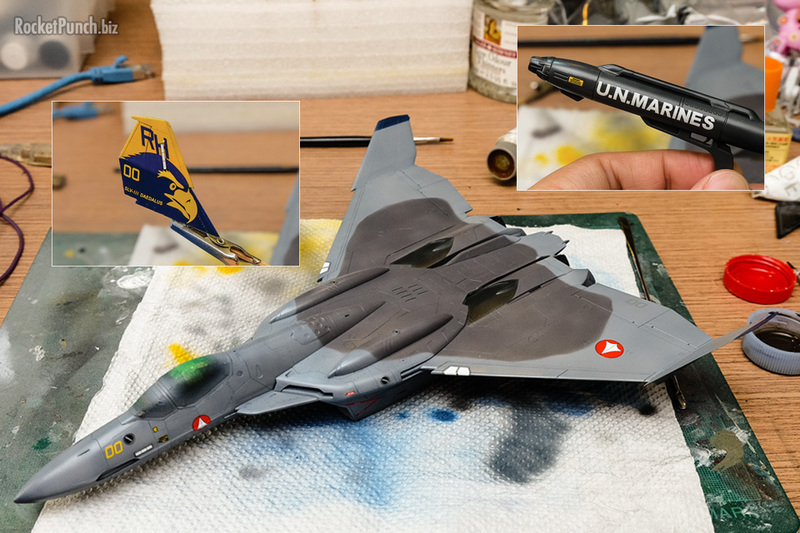 This kit is no different but I decided to go with a more conventional build with this one so I put together most of the kit (like an aircraft kit) and will go from there. My workmanship hasn’t been great for this build though. 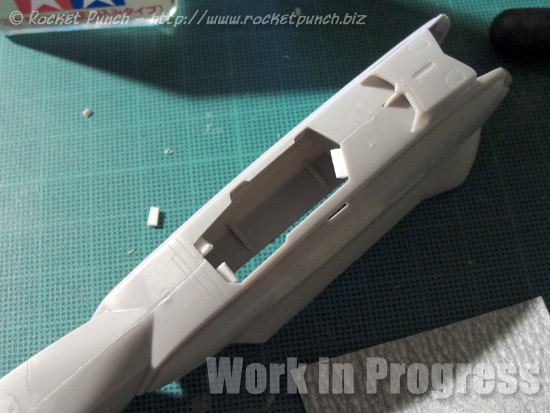 There are some obvious steps on the joints between the wings and the fuselage. Not sure if I can overcome these. Anyway, work continues. Haven’t touched the project in a while. I always get bogged down in the puttying stage. Heh. 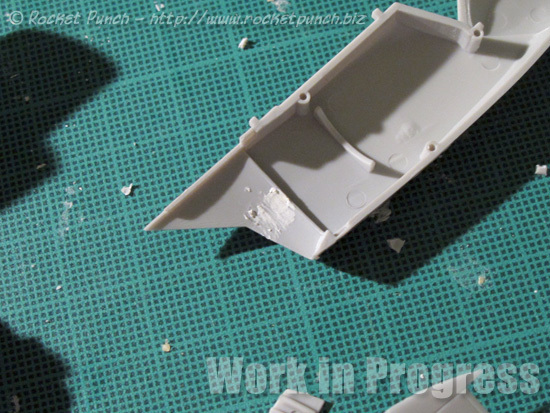 Below is actually my 3rd round of sanding. Meh. But I’m planning to enter this into Plamo’s WOOB competition and the due date is end April so I have to go go go! There’s a long seamline all the way down from the intake to the exhaust. Sigh. 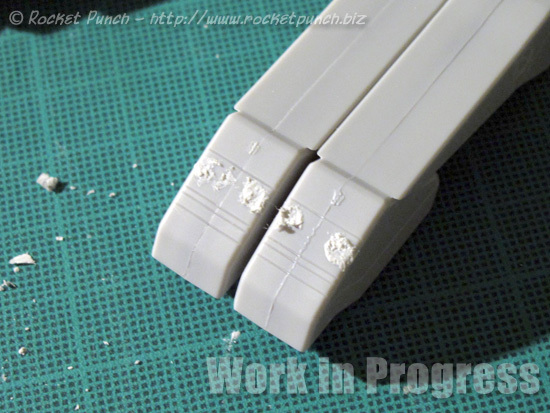 Some work needed to be done to close the rear landing gear doors. 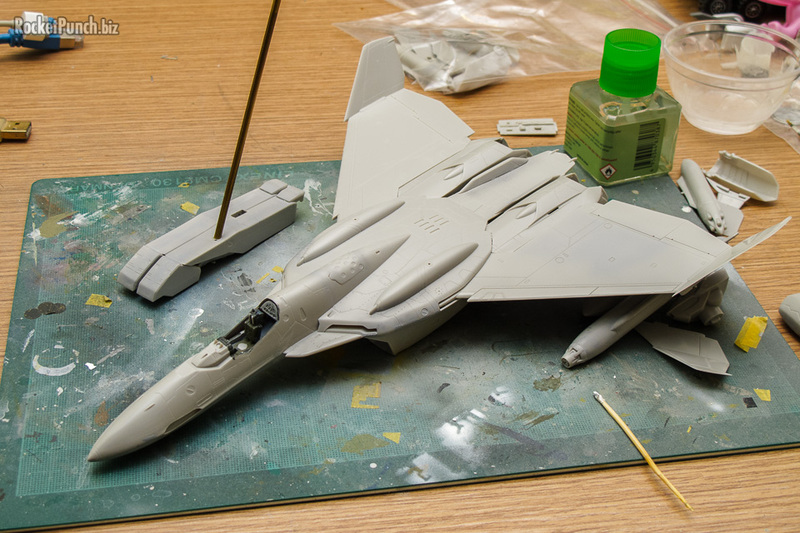 As mentioned before, it’s clear Hasegawa means for this kit to have the landing gear down. I added some plastic card to the inside of the gearbay so the doors won’t fall in. Then I use some more plastic card to act as a bridge to join the two halves together. I also cut off the gear door actuators. A bit of sanding to shape and elbow grease later, the doors are in. Some more sanding required but it’s not too bad. Urgh… many many injection pin marks. Some in crazy places. Some badly molded parts too. Nothing that putty can’t fixed though. Pin marks inside the intake is a typically Hasegawa thing. Simple to fix but annoying. 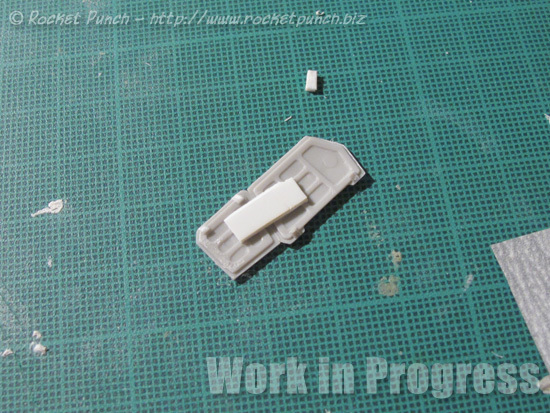 Some of the parts will actually be hidden. So hidden that I won’t need to paint it. So it’s here for posterity :D.